Mercury Shift, 2 player games, Play Mercury Shift Game at twoplayer-game.com. 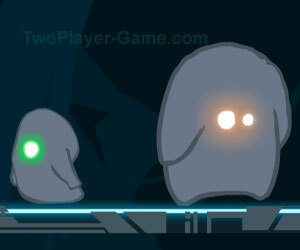 Grab a friend and together you'll control the two blobby aliens through the levels. Cooperate to escape from the planet you stranded on. Help each other to collect the points and reach the exit. Feel free to kill your buddy to steal his stuff, but be so kind to revive him afterwards. Help both player reach the exit.